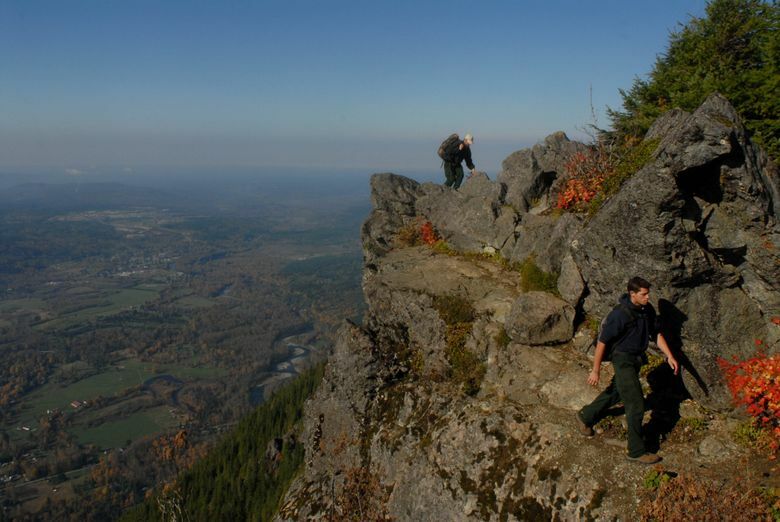 Two East King County trails have been designated National Recreation Trails. The new status brings more funding sources and special signs. Two East King County trails have been designated National Recreation Trails. Secretary of Interior Sally Jewell and National Park Service Director Jonathan Jarvis announced the designation Thursday for the Mount Si Trail, a popular thigh-burning hike to near the top of the 4,167-foot monolith on the edge of North Bend, and the Snoqualmie Valley Trail, a multiuse path along a former railway bed paralleling the Snoqualmie River for more than 31 miles from Duvall to Rattlesnake Lake. They were among 10 trails nationwide added to the National Recreation Trail roster, which lists more than 1,000 trails across the country. The Interior Secretary adds trails to the list annually to coincide with National Trails Day, which occurs this Saturday. The designation recognizes “exemplary trails of local and regional significance” in response to an application from the trail’s managing agency or organization. Among benefits are national promotion, technical assistance, access to state and federal funding, and special signage.